Paris may be the city of love, but it’s our position here at the Gates Hotel Diagonal Barcelona that the city we call home has just as much romance on offer! With 23 Michelin-starred restaurants, dozens of upscale wine bars, and a whole lot of old world charm, Barcelona is fertile ground for romantic moments. If there’s one romantic moment you want to get just right, it’s a marriage proposal. If you’ve been thinking about popping the big question, the city of Barcelona makes for the perfect setting. Font Màgica de Montjuïc, or The Magic Fountain, is Barcelona’s largest ornamental fountain, integrated as the main feature in a complex of fountains, cascades, and pools on Avinguda de la Reina Maria Cristina. 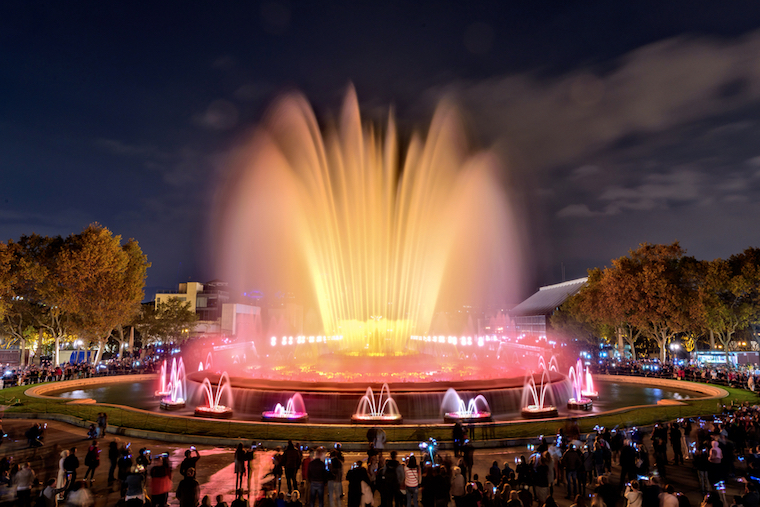 The fountain has become an emblem of Barcelona, with its dazzling production of light-and-water shows, attracting two-and-a-half million visitors every year. If you’re looking for an iconic location that screams Barcelona, it doesn’t get any better than this. If the Magic Fountain isn’t magic enough, how about the best view in the entire city? One of Barcelona’s hidden gems, the Bunkers Del Carmel sit atop the Turó de la Rovira, a hill in the district of El Carmel. The bunkers were built in 1938, during the Spanish Civil War, to house large, 105mm cannons, mounted on concrete platforms, used to defend against air raids. Today, the bunkers are largely abandoned, save for tourists seeking a breathtaking panoramic view of the city and the ocean beyond. While there is no bad time to visit the Bunkers Del Carmel, it is particularly stunning at sunset. 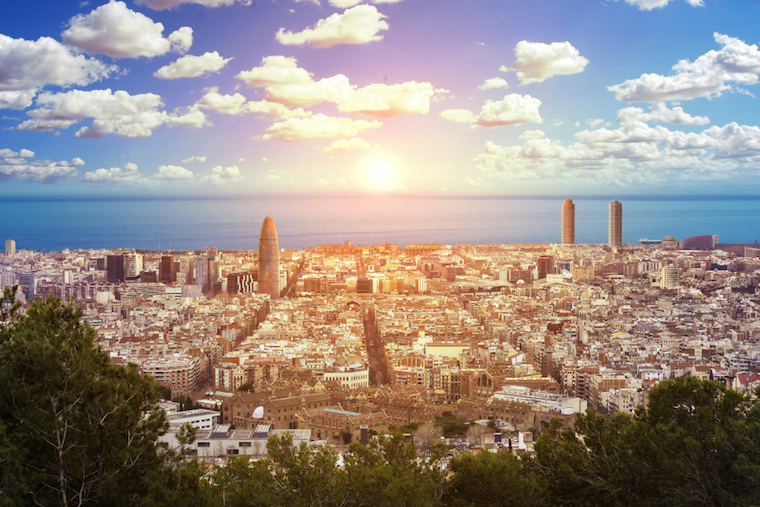 There are no shortage of spectacular views in Barcelona. If you’re looking for a truly unique location to pop the question, consider taking a short tram ride on the Funicular de Tibidabo Railway to the summit of Tibidabo mountain — the largest in the Serra de Collserola. 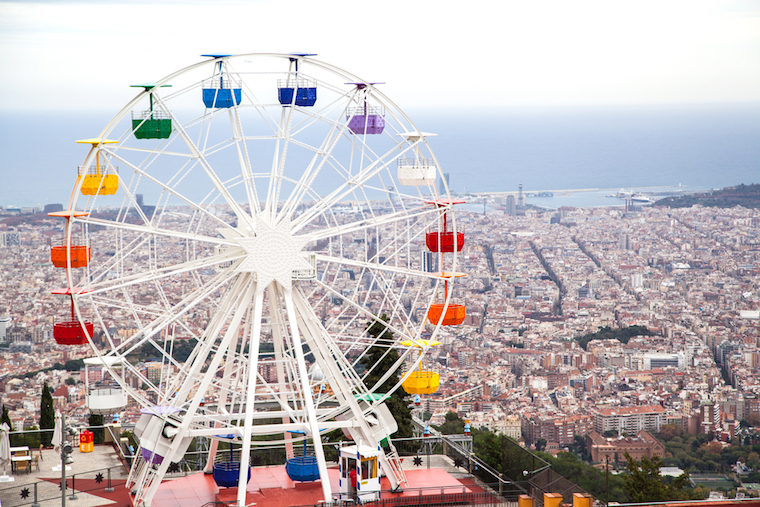 At the top, you’ll find a charming amusement park with a breathtaking view of Barcelona. The best view in the park, and the most romantic location to ask your loved one to marry you, is atop the colorful ferris wheel. If the park looks familiar, it may be because it was featured in the 2008 Woody Allen film, Vicky Cristina Barcelona. Parc del Laberint d’Horta, or Labyrinth Park of Horta, is a gorgeous historical garden located in Barcelona’s Horta-Guinardó district. 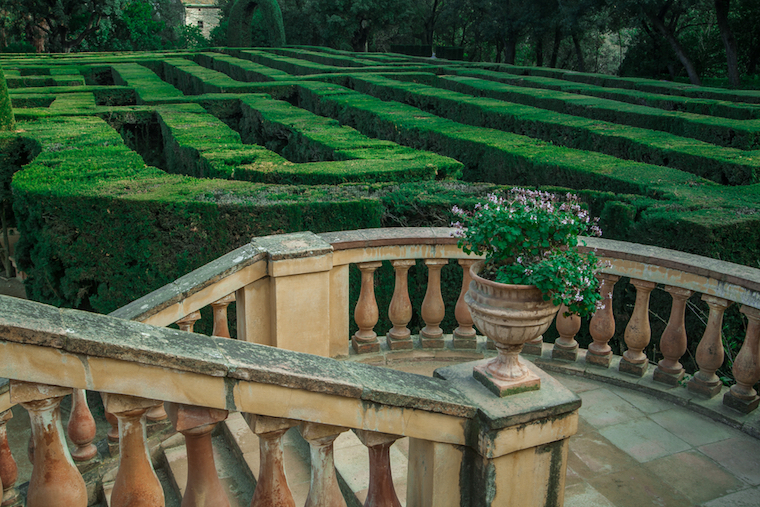 Created in 1791, the garden is best known for its 2,400 foot hedge maze, made of trimmed cypress trees, and stunning Neoclassical and Romantic architecture. There are lots of little corners to propose in here; at the top of the Danae Pavilion, in front of the romantic garden waterfall, or in the center of the labyrinth. There’s no wrong answer! If you’re looking for a more traditional approach, you can’t go wrong with proposing at a beautiful restaurant after a stunning meal. There’s no restaurant more perfectly suited for a wedding proposal in all of Barcelona as Restaurante Lasarte. This is Spanish haute cuisine at its finest. Restaurante Lasarte is the first and only restaurant in Barcelona to have earned three Michelin stars. Chef Martín Berasategui is world renown for his creativity in the kitchen and has turned plating into an art form. Your partner will be so taken by the attractiveness and taste of the dishes, he or she won’t even notice you reaching for that ring hidden in your pocket. The perfect setting will transform your special moment into a fairytale experience. The Gates Hotel Diagonal Barcelona wishes you the best of luck and all the happiness in the world.